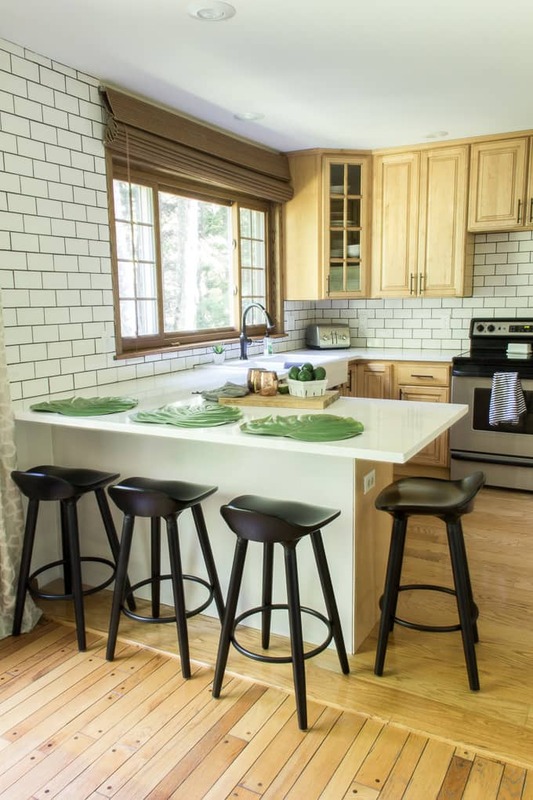 This classic subway tile backsplash was a simple DIY that added a ton of character to our kitchen. Our new subway tile backsplash is DONE! Recently I shared our new kitchen countertops and stools, but this was the final piece that needed to be completed! Now that it’s done I’m SO happy that I went with Subway tile! 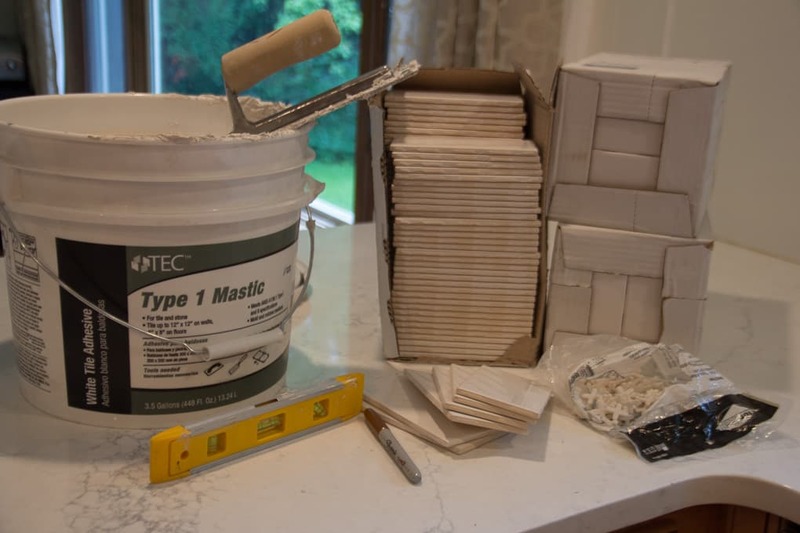 Today I’ll explain how simple DIY’ing a tile backsplash really is! Before tiling, I used mesh drywall patches to repair the damaged spots from removing the old backsplash. Then I started in a corner so that I wouldn’t end up with slivers of pieces in the corner. For the first row I used spacers under each tile, just to give it the perfect gap from the countertop. It’s important to make sure that your first row is level, because if it’s not you will only run into problems from there.Then I just worked my way up, being sure to use spacers under and next to every tile. The outlets are the hardest part of tiling, often they just require cutting an “L”, but as you can see for this outlet it required a “U”. With our tile saw that just means that we make a ton of side by side cuts until we have cleared out all the excess tile from the “U”. Here I am in all my tiling glory. 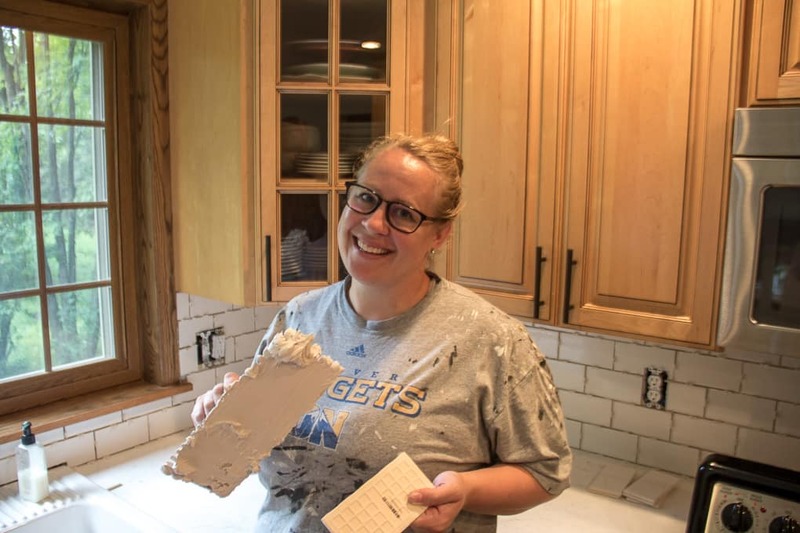 One bonus tip is when you’re trying to fit a tile into an awkward spot don’t worry about trying to get mortar on the wall, instead just mortar the back of the tile like I was doing here. I had asked on Facebook and Instagram for suggestions on grout color, and had a hard time deciding between white or dark grout. 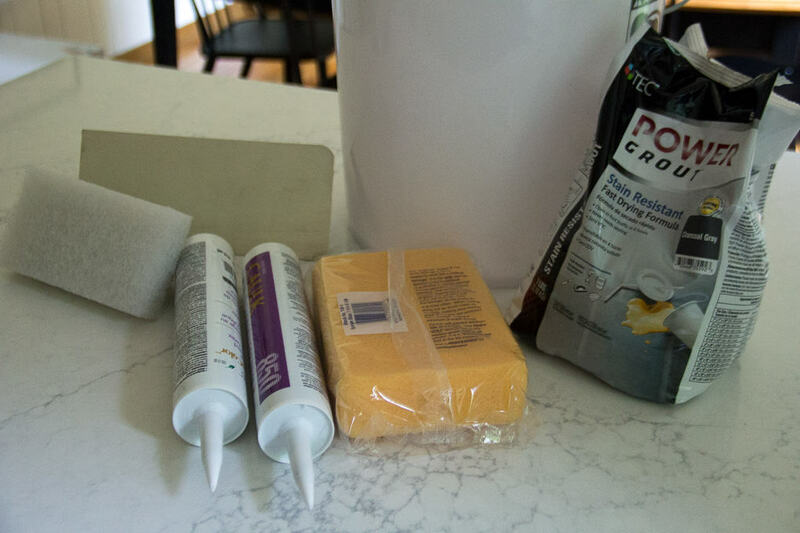 Dark grout stands out, vs. white grout would be a bright clean look. Dark grout also shows tiling imperfections, vs. white grout hides them. In the end I decided to go with the dark grout and I’m so glad that I did! 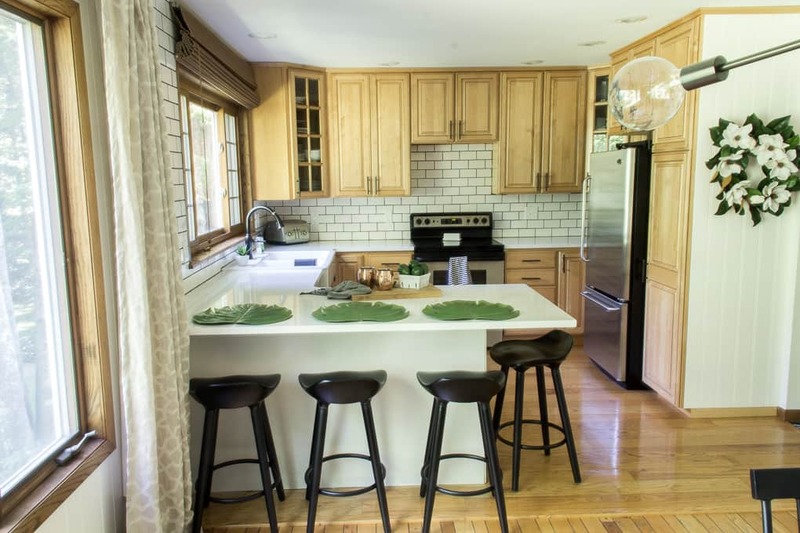 I love how to works with the dark lines on the cabinets and the cabinet hardware. 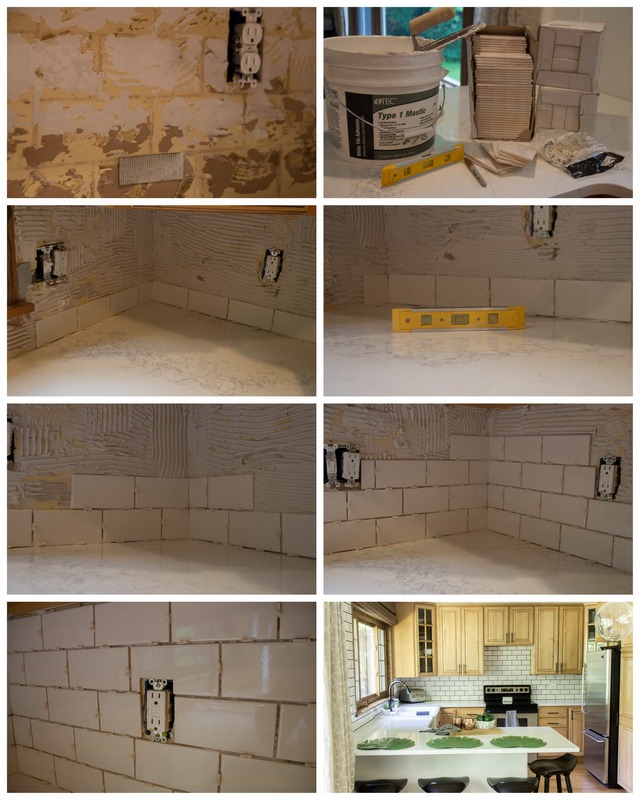 If you’re looking to make an affordable simple update, tiling a backsplash can make a dramatic transformation. 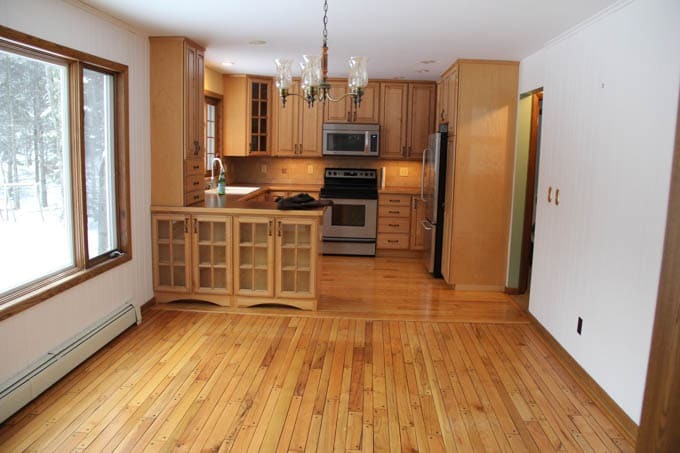 Take a look at how far this little kitchen has come compared to this before picture! 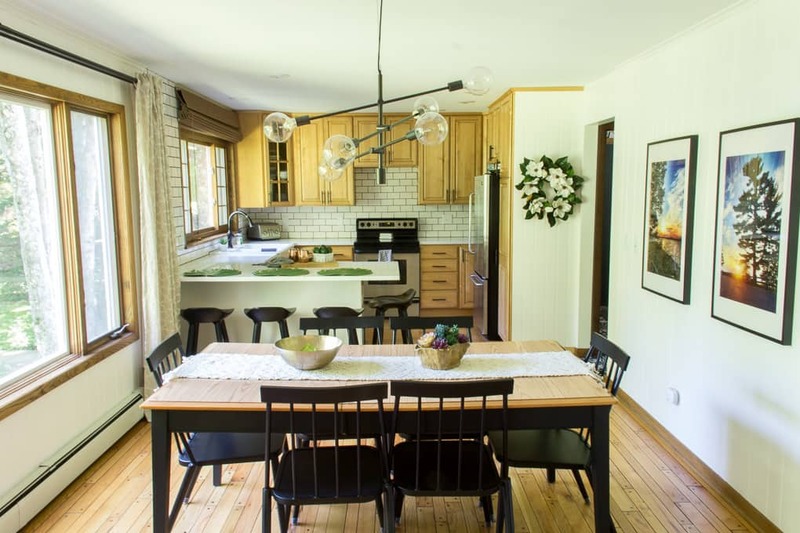 Other than the countertops, all of the updates we’ve made in here have been very affordable. 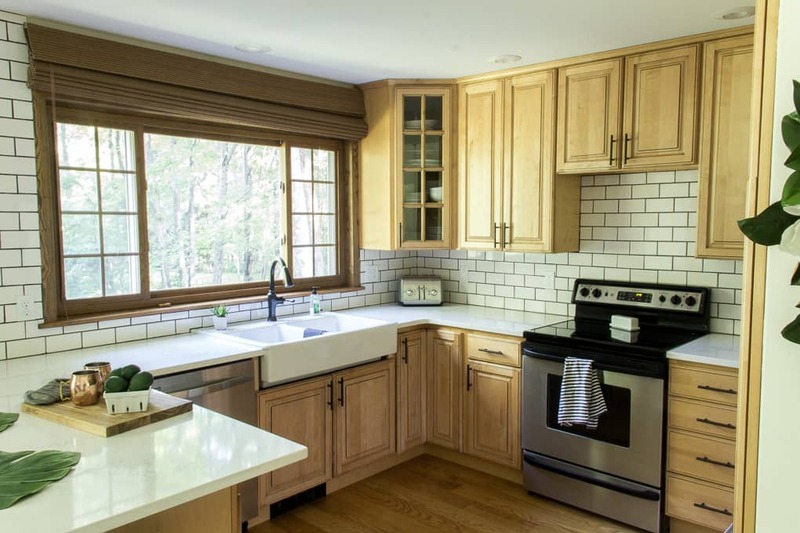 Thanks so much for stopping by today and checking out our new subway tile backsplash! This is exactly what I was looking for. Thank you so much for sharing the details!! It’s going to help me tons!